WMA is a Warehouse Management Application, used in Shipping & Logistics industry to manage the transfer, loading and receiving of cargo between destinations. Warehouse user uses Barcode Scanner to scan the lot number from the label attached with Cargo and performs dimming operation to calculate the dimensions of Cargo. 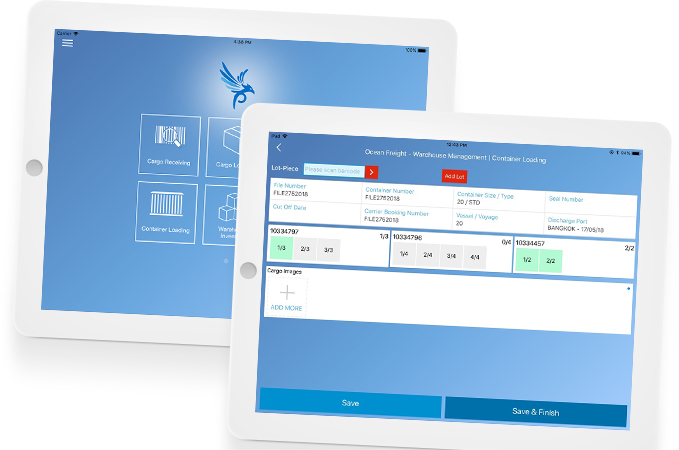 WMA app can automatically calculate the dimensions of Cargo with the help of Cargo Spectre device. A user can upload the images of received Cargo. A user can also update other values related to the state of Cargo. With the integration of powerful Amazon Rekognition API, WMA can easily perform OCR on Marks and Numbers text used in the shipping industry. With all these stunning features, WMA reduces manual efforts of warehouse users, which results in better productivity along with accurate tracking of Cargo.